Pictured at the Center Parcs recruitment information day were Deputy Heather Humphreys TD, Minister for Business, Enterprise & Innovation, Deputy Kevin ‘Boxer’ Moran and Senator Gabrielle McFadden, who welcomed potential employees to the Longford Forest site on Friday last. Picture Jason Clarke. 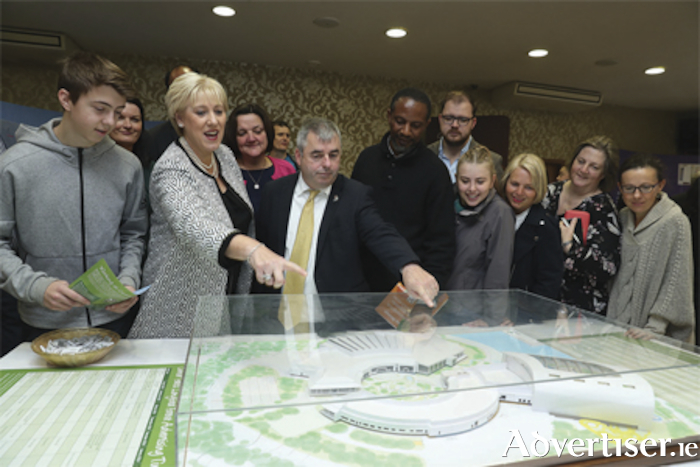 The Center Parcs’ recruitment information day, officially opened by Minister for Business, Enterprise and Innovation, Heather Humphreys, T.D. was a hive of activity as potential employees to hear about the recruitment process for the much anticipated one thousand permanent roles being created in the Midlands by the company. The new €233m Center Parcs Longford Forest resort is due to open in the summer of 2019. Prospective job candidates were invited to meet and engage with a 30 strong team of current Center Parcs employees hailing from all parts of the business and its five successful resorts in the UK, including a significant number of senior management figures and the growing Irish management team. Attendees learned, for example, what it will take to become a lifeguard at the subtropical swimming paradise, which will be Ireland’s largest indoor swimming complex heated to a balmy 29.5C all year round and complete with water rides for all ages, or what is involved in being a forest ranger taking care of the beautiful 400 acre woodland in which the resort is situated. Delivering an amazing guest experience at Center Parcs Longford Forest will require a large complement of staff with a huge breadth of general and specialist skills. The jobs on offer represent all segments of the Center Parcs business including food, beverage and retail, leisure, housekeeping, technical services and support roles. The roles on offer range from an accountant to a bus driver as well as, chefs, receptionists, beauty therapists, lifeguards, baristas, bike mechanics, water sports assistants and climbing instructors, to name just a few. Opening the recruitment day, Minister Heather Humphreys, noted the vast economic benefit which the opening of Center Parcs will have on the Midlands region. “It is fantastic to see the Midlands benefitting from the influx of an unprecedented 1,000 jobs. I have been struck today by both the enthusiasm of the candidates and the commitment that Center Parcs demonstrates to hiring good people and developing great lifelong careers for them. Today is a special day as we are witnessing not just the vast economic impact that Center Parcs will have, but the even greater social impact. “The careers on offer provide a generation of people in the Midlands region with the opportunity to work and live at home with their families. I wish continued success to Center Parcs as it gears towards opening next year and I wish the candidates well on their new career path,” the Minister remarked. When complete next year, the €233m Center Parcs resort will offer 466 lodges and 30 apartments to accommodate 2,500 guests. The development has created over 750 jobs during the construction phase and when operational, the village will employ up to 1,000 people in permanent jobs and provide a €32m boost to the economy.